​Boasting ancient castles, Jurassic landscapes and recent infamous history the Wild Atlantic Way Adventure has hidden treasures to explore. As we arrive in the Port of Dublin you soon realise the warmth of the Irish people, welcoming and friendly their general chatty nature brings a smile to anyone. 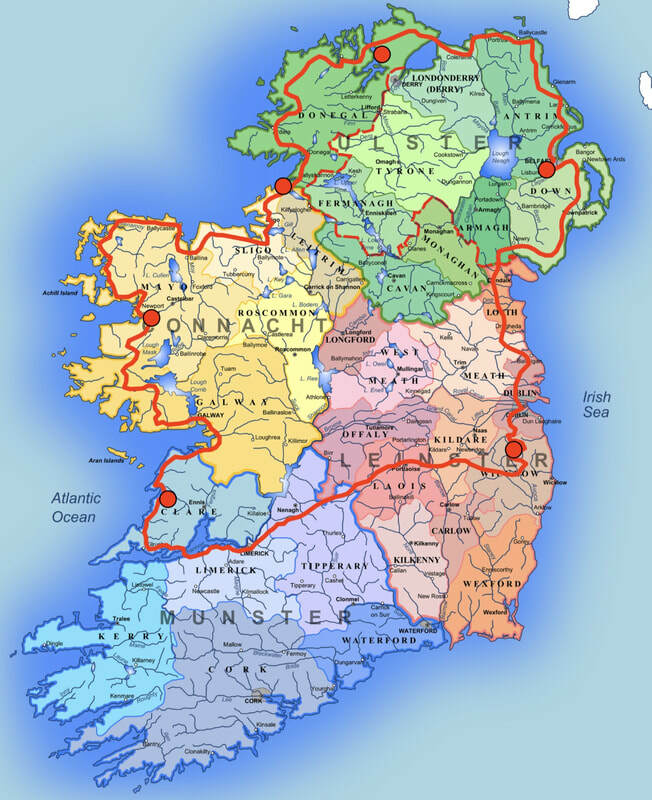 The adventure leads us over the Wicklow Mountains and across to Shannon Estuary where we pick up the route north through Galway, Connemara into Mayo and Donegal before crossing the border into Northern Ireland to Belfast. 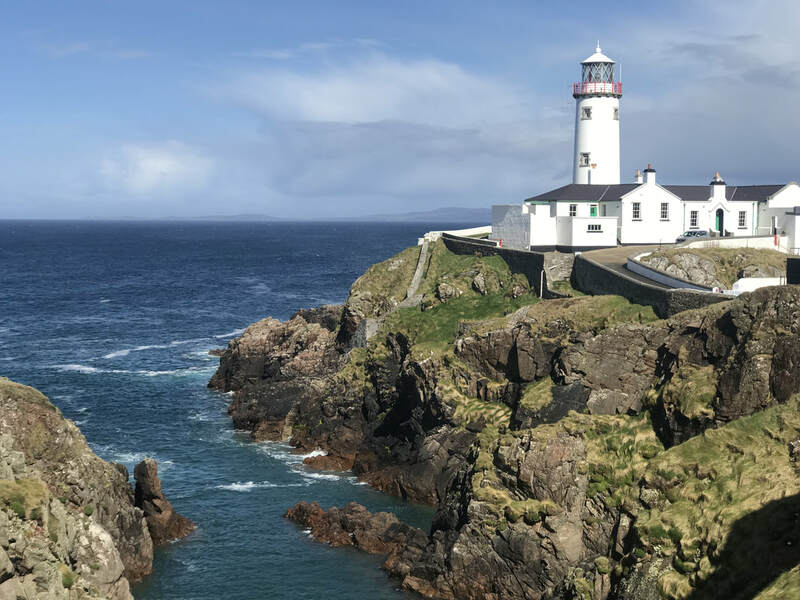 Along the route you will find many visual highlights Ireland has to offer such as dramatic high cliffs, deserted sandy beaches, hidden coves and of course the coastal roads. 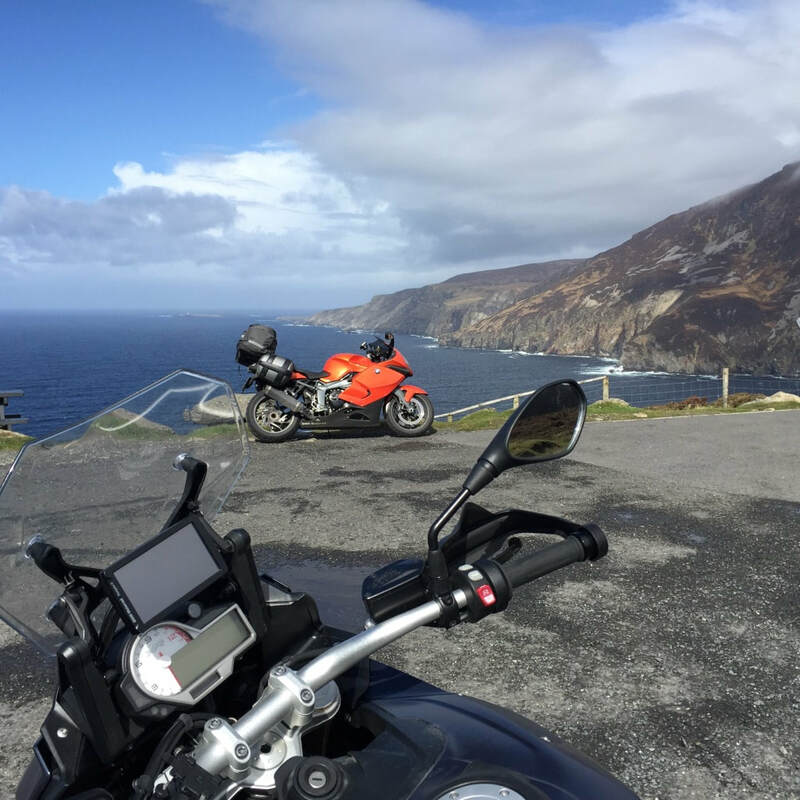 ​The Wicklow Mountains - are nestled just south of Dublin and amongst the peaks are roads that carve through the valleys just begging to be ridden. We discover the source of the River Liffe and past the Guinness Lake and waterfalls. Westport - is a little town on the West Coast where you will find the “Craic” by the bucketful. Little Irish pubs, great Guinness and of course the music, has to be sampled. Irelands Fjords - A impressive network of Fjords a narrow inland sea with three steep sides and an opening to the ocean. We ride the coast of the largest Fjords in Ireland home to famous seaweed baths, a cure for aches and pains. The Slieve League Cliffs are the highest sea cliffs in Europe and at just short of 2000ft are dramatic and spectacular. A great photo opportunity as we can take the bikes directly to the cliffs. The Glengesh Pass is a ribbon of tarmac with switchback corners as we head towards the remote Glenveagh National Park and the Peat bog farms. North West 200 Circuit - we’ve all seen the races on the TV, get to ride the picturesque circuit. ​North Antrim Coast Road - weave through this undulating strip of coastal road that seems to go on forever. ​Titanic experience - Our visit to Belfast is never complete unless we spend some time to look around the city, Black Cab tours and the Titanic Museum are always popular. We will meet at the Royal Victoria Hotel in Llanberis for dinner at 19:00 however why don’t you come earlier to take the train to the summit of Snowdon or look around Betws-y-coed. Today we ride through the Snowdonia National Park and over the Menai Bridge onto the island of Anglesey to catch the fast boat to Dublin. 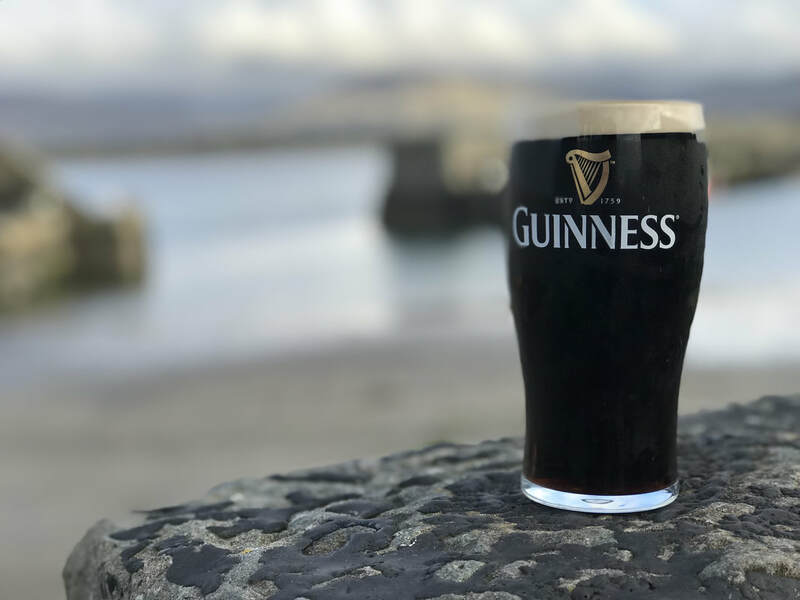 After we navigate the roads through Dublin we head along the coast and into the Wicklow Mountains to the Guinness Lake and Sally Gap to Laragh for our first night enjoying the Irish Craic at the Wicklow Heather. After breakfast we’re on it and heading over to the West Coast of Ireland. 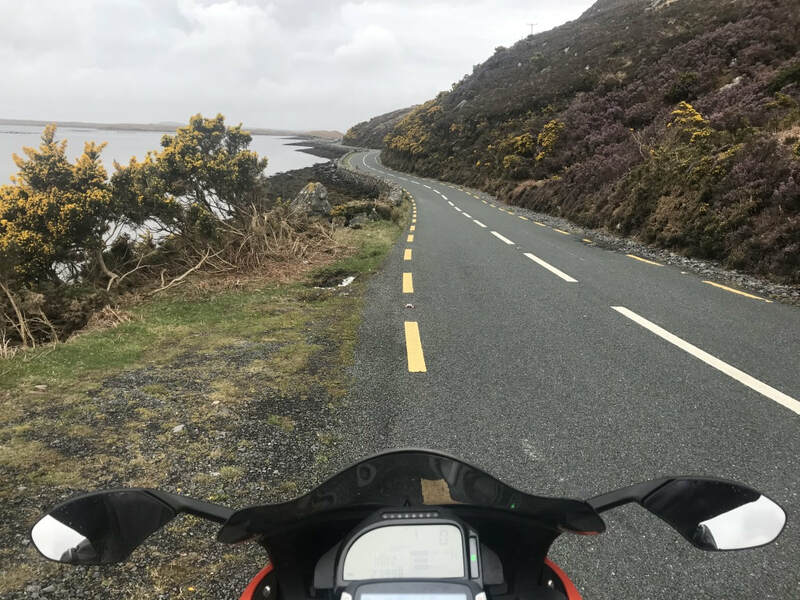 The route through the Wicklow Gap is a narrow bumpy strip of tarmac and is so easy to lose yourself in riding the bike. Coffee at the Newbridge Silver factory, great for gifts to take home and a quick blast down the main highway to Foynes. Will need to jump on the Tarbert Ferry across the Shannon River to start the Wild Atlantic Way. We wake this morning in the shadow of the Cliffs of Moher and maybe get a glimpse of the Holy Stone of Clonrichert now a Class 2 relic. 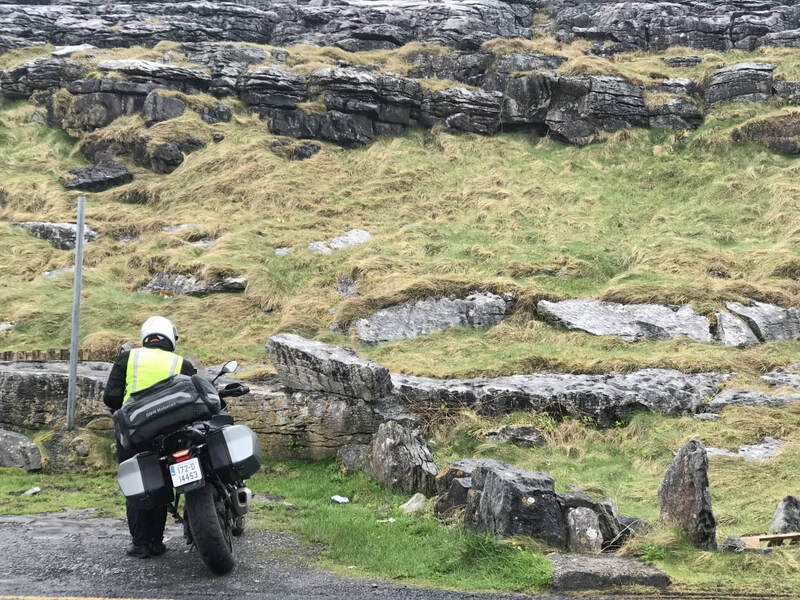 We then ride along the Cliffs at Burren to coffee at the Dark Caves at Aillwee and onto Galway to continue the Wild Atlantic Way. We take to the Sky Road along the peninsular which gives us great photo opportunities and then onto the first of Irelands Fjords. A later start today to get over the “Craic” we had the night before. Today we continue along the coast line to Black Sod, a remote peninsular where the local Coastguard lost a helicopter and their crew in 2017. 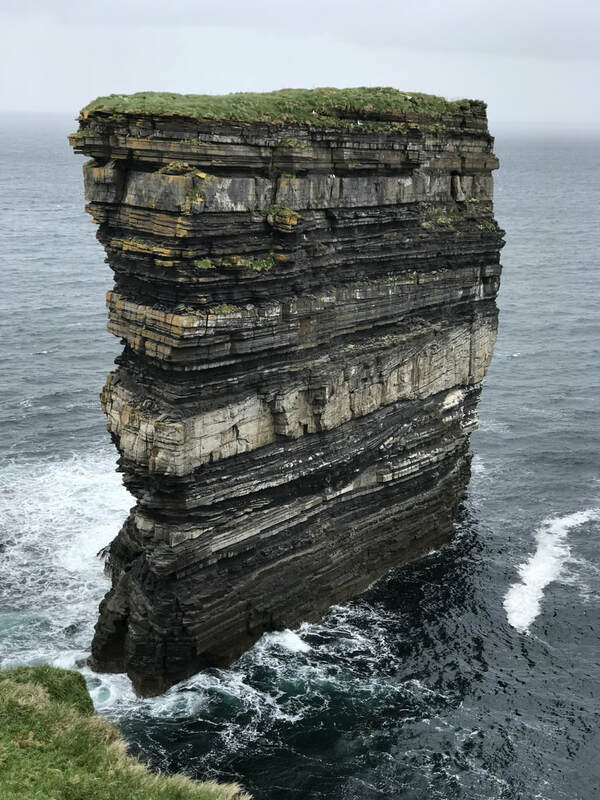 We also visit the Rockstack and Blowholes at Downpatrick Head until we get into Bundoran the home of Irish Surf. Surfers come from all around the world to ride the waves, reported to be up to 40 foot following the Winter storms in the Atlantic. 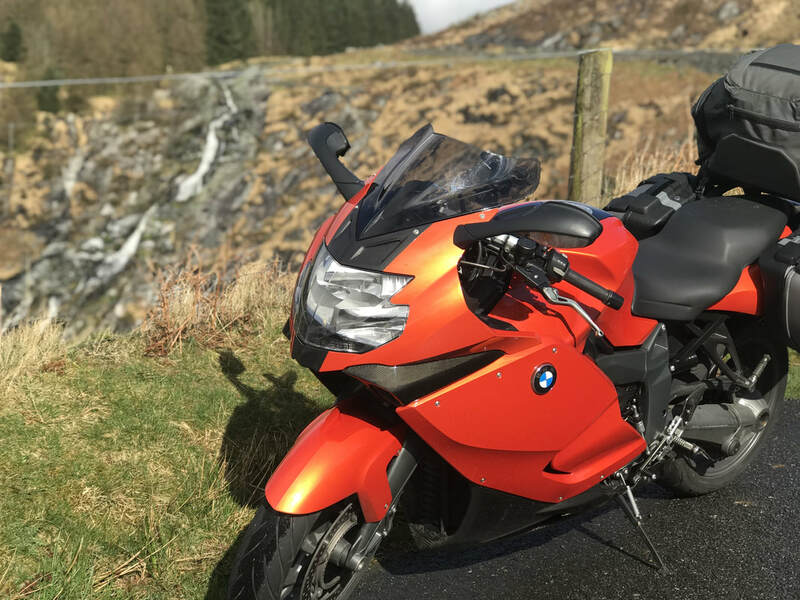 One of our favourite days for riding as we go through the Glengesh Pass and into the Glenveagh National Park, remote, smooth and of course beautiful to look at. 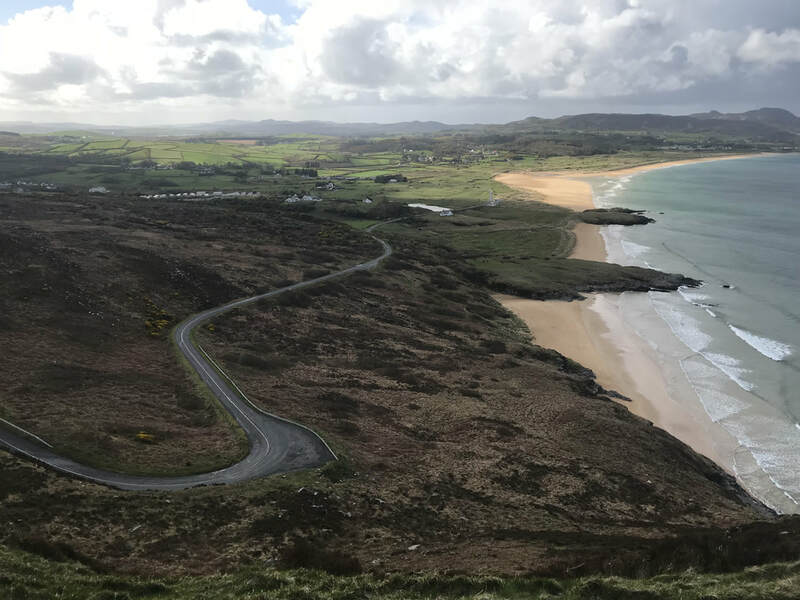 Today we hit the most northern part of the ride as we visit Fanad Head where they shot the last Star Wars film, The Last Jedi. 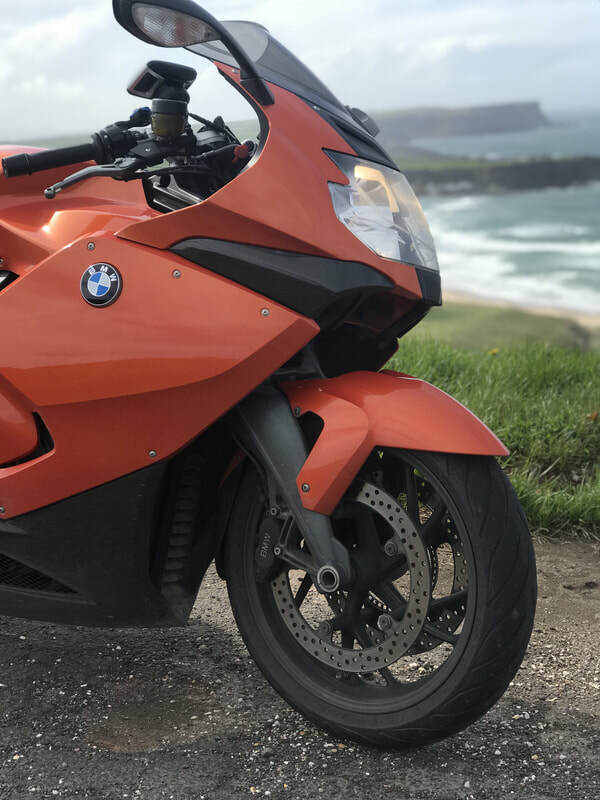 Today we cross the border into Northern Ireland and following a quick skirt around Londonderry we find ourselves again at the coast, this time its the North Antrim Coast Road. 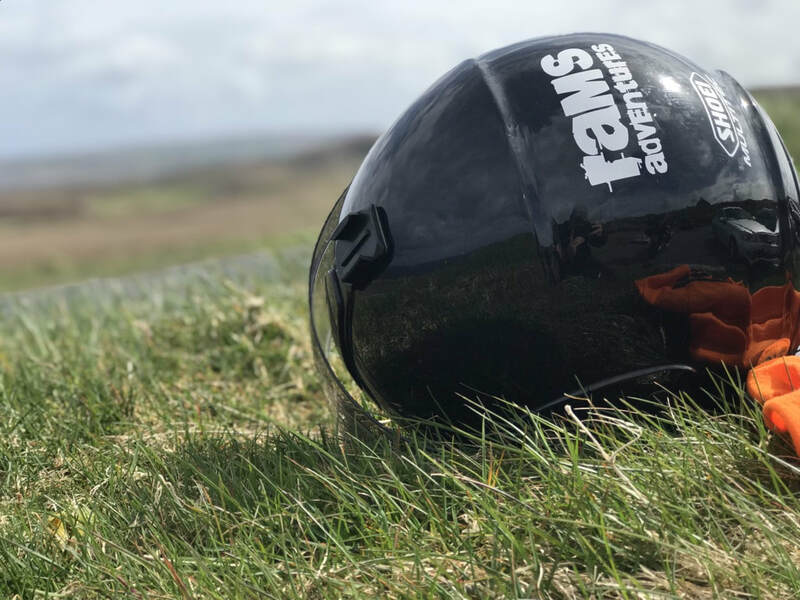 Following a quick lap of the North West 200 circuit we stop for lunch at the Giants Causeway and ride some incredible roads. This afternoon it is coast hugging roads all the way to Belfast, see the giant cranes of Samson and Goliath in the distance as we approach the city. This morning is your own, with a leisurely breakfast you can either look around the Titanic Museum, which is next door or take one of the City Black Cab Tours along the Falls Road and understand the history of Belfast. We meet at 13:00 at the bikes to ride to Warrenpoint along the coast. After breakfast we head down to Dublin so we can catch the 14:00 ferry back to Holyhead, we will be stopping off at the Skerries for a quick coffee and maybe a bun. 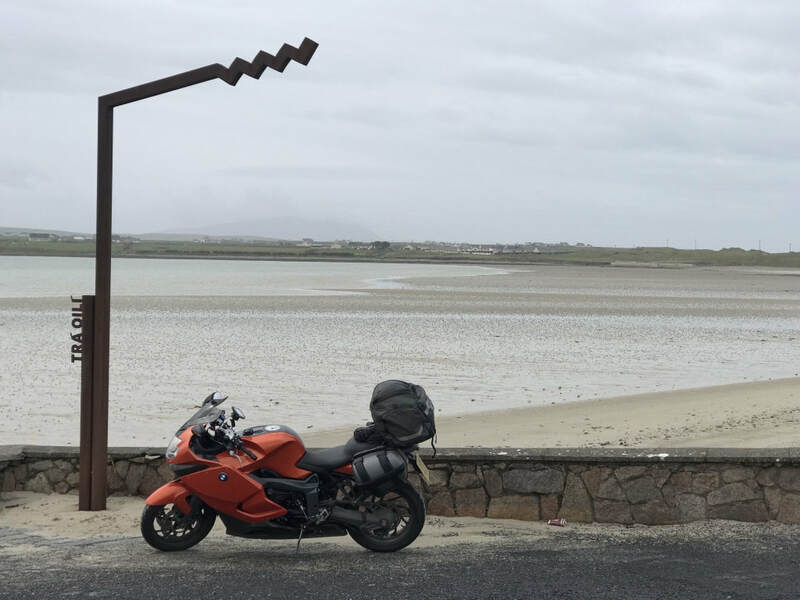 ​To take your own motorcycle or we can arrange bike hire in Dublin. All tours have a British MEDICAL TEAM riding on the trip travelling with you, so any medical assistance required is given immediately. Ferry from Holyhead in Anglesey to Dublin and return. ​Easy road riding which can be suitable for pillion passengers. Some days require us to do ride up to 200 miles. UK based Medics riding with the group. Meals – breakfast and dinner.